Early learning in Queensland Government-approved kindergarten program provides a building block to a better future. Going to kindy will help your child lean early literacy and numeracy concepts and develop communication skills to help their reading and writing. Most importantly, a kindergarten program will help your child develop a love of learning, be better prepared to starts school and make heaps of friends. Children learn through play. In a kindergarten program, your child will participate in play-based learning experiences designed to encourage their physical, social, intellectual, language and emotional abilities. Make friends and learn how to cooperate with other children. Become more independent and confident in their abilities. Identify, explore and solve problems. 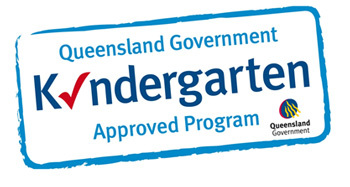 Aligned with Queensland Kindergarten Learning Guideline or other Queensland studies Authority- accredited learning program. Is taught and delivered by 2 qualified early childhood teachers in each of the kindergarten room. The program runs from7:50am to 5:30pm and for 40 weeks a year. The Kindergarten Guidelines' is a supporting document for the Early Learning Years Framework. It was put in place as an extension on the Belonging, Being and Becoming concept and acts as a bridging period for working towards the Prep Outcomes in schools. The Kindergarten Guidelines are specifically relevant to children aged 3yrs and above. A big focus of the Kindergarten Guidelines is the importance of effective INTENTIONAL TEACHING. Kindergarten fact sheets for parents are available on the Office for Early childhood Education and Care website (also available in other languages), you can download a copy here. Copies of the Kindergarten Learning Guidelines and other teaching materials can be viewed on the QLD Studies Authority website. Australian Government Department of Education, Employment and Workplace Relations for the Council of Australian Governments, 2009. Being, Belonging and Becoming-The Early Years Learning Framework of Australia. Queensland Studies Authority, 2010. Continua of Learning and Development- Queensland Kindergarten Learning Guideline Companion. Queensland Government, Australia. Queensland Studies Authority, 2010. Queensland Kindergarten Learning Guidelines. Queensland Government, Australia.